Long bent palms over pristine white sand beaches … sounds like something that you can only see in the movies right? Well, Tortuga Island, Costa Rica is like a scene from a film depicting tropical paradise! All Costa Rica vacations should include a trip to la Isla Tortuga. There area several ways to get to Tortuga Island, all depending on where you are at. From the Airport or central valley, by far the easiest way is via Jaco Beach. Most tour companies will pick you up at your Hotel or you can meet them at a designated pickup point if you are staying in a private residence. From Jaco, they will take you the 5 to 10 minute drive over to Herradura where you will board your boat. Travel time to the Island varies from 50 minutes to 2 hours, depending on whether it is a full day Party Cruise or a half day Island Adventure. Maybe you are boarding a 100 foot catamaran, or perhaps a yacht, either way you’ll be crossing 25 kilometers of Pacific Ocean at the mouth of the Gulf of Nicoya. This beautiful natural reserve lies just off the shore of the Nicoya Peninsula and if you are lucky, you’ll get a pod of dolphins to follow your boat while on your way to the Island. So … is this going to cost me an arm and a leg? 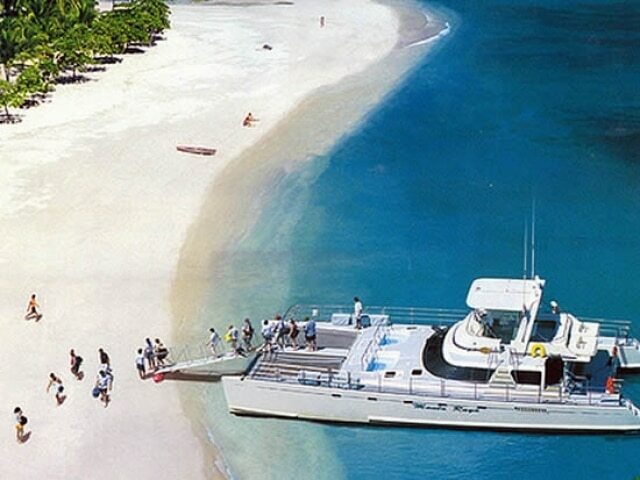 Trips to Tortuga Island run at about $125 per person if you are being transported from San Jose or Jaco Beach but they can be a few bucks more if you need to be transported from farther out and whether or not you are taking an all-included booze cruise. Either way, fruit snacks, drinks & a basic lunch are usually included. Full day adventures may have breakfast as well! WOW … the Water is Amazing! Being tucked just inside the gulf, near to shore, the Island area is sheltered from the pounding swell and hard currents of the Pacific Ocean. This gives the water wonderful visibility all year round for snorkeling and diving. People frequently see dolphins, manta rays, sea turtles and tropical fish of all varieties! Once on the beach, you also have the activity options of Canopy Tours, Sea Kayaking or Banana Boat Rides. You can also just hang out and drink out of fresh coconuts while relaxing on beautiful white sand beaches! We hope you visit Costa Rica soon and put Tortuga Island on your list of Jaco Tours.